Russian pilot cosmonaut 1960-1967. First person to die during spaceflight when the parachute lines of Soyuz 1 tangled and it crashed to earth. Cosmonaut training March 1960 - 3 April 1961. Call sign: Rubin (Ruby). Status: Deceased; Active 1960-1967. Born: 1927-03-16. Died: 1967-04-24. Spaceflights: 2 . Total time in space: 2.13 days. Birth Place: Moscow. In honor of his life and work a lunar crater, the asteroid 1836 and the military pilot school in Yeisk were named after him. Died in Near Novoorsk, Russian SFSR. Family: Cosmonaut. Country: Russia. Spacecraft: Vostok, Voskhod. Flights: Vostok 4, Vostok 10, Vostok 11, Vostok 12, Voskhod 1, Soyuz 1. Agency: VVS. Bibliography: 4452, 5636. Gagarin and Komarov during Soyuz 1 training. 1927 March 16 - . Birth of Vladimir Mikhailovich Komarov - . Nation: Russia. Related Persons: Komarov. Russian pilot cosmonaut 1960-1967. First person to die during spaceflight when the parachute lines of Soyuz 1 tangled and it crashed to earth. Cosmonaut training March 1960 - 3 April 1961. Call sign: Rubin (Ruby). 2 spaceflights, 2.1 days in space. Flew to orbit on Voskhod (1964), Soyuz 1. 1962 August 12 - . 08:02 GMT - . Launch Site: Baikonur. Launch Complex: Baikonur LC1. LV Family: R-7. Launch Vehicle: Vostok 8K72K. Vostok 4 - . Call Sign: Berkut (Golden Eagle ). Crew: Popovich. Backup Crew: Komarov, Volynov. Payload: Vostok 3KA s/n 6. Mass: 4,728 kg (10,423 lb). Nation: Russia. Related Persons: Nikolayev. Agency: RVSN. Program: Vostok. Class: Manned. Type: Manned spacecraft. Flight: Vostok 4. Spacecraft: Vostok. Duration: 2.96 days. Decay Date: 1962-08-15 . USAF Sat Cat: 365 . COSPAR: 1962-A-Nu-1. Apogee: 211 km (131 mi). Perigee: 159 km (98 mi). Inclination: 65.00 deg. Period: 88.20 min. Joint flight with Vostok 3. Acquisition of experimental data on the possibility of establishing a direct link between two space ships; coordination of astronauts' operations; study of the effects of identical spaceflight conditions on the human organism. The launch of Popovich proceeds exactly on schedule, the spacecraft launching with 0.5 seconds of the planned time, entering orbit just a few kilometers away from Nikolayev in Vostok 3. Popovich had problems with his life support system, resulting in the cabin temperature dropping to 10 degrees Centigrade and the humidity to 35%. The cosmonaut still managed to conduct experiments, including taking colour motion pictures of the terminator between night and day and the cabin interior. Despite the conditions, Popovich felt able to go for the full four days scheduled. But before the mission, Popovich had been briefed to tell ground control that he was 'observing thunderstorms' if he felt the motion sickness that had plagued Titov and needed to return on the next opportunity. Unfortunately he actually did report seeing thunderstorms over the Gulf of Mexico, and ground control took this as a request for an early return. He was ordered down a day early, landing within a few mintutes of Nikolayev. Only on the ground was it discovered that he was willing to go the full duration, and that ground control had thought he had given the code. Cosmonauts Tour Glushko Factory - . Nation: Russia. Related Persons: Alekseyev, Semyon, Glushko, Khrunov, Komarov, Korolev. Flight: Vostok 5. Spacecraft Bus: Sokol. Spacecraft: Sokol SK-1. Victory Day Holiday in the Soviet Union. The cosmonauts toured Glushko's engine factory. Glushko has 11,000 employees at four locations. The resentment between Glushko and Korolev, going back to their time in the Gulag, is apparent. Korolev calls during the tour but Glushko does not return his call. Later Alekseyev contacts Kamanin and proposes that Komarov be the back-up cosmonaut for Vostok 5 rather than Khrunov - because he hasn't finished the suit yet for Khrunov! Vostok 7 (cancelled) - . Crew: Komarov. Payload: Vostok 3KA s/n 9. Nation: Russia. Related Persons: Komarov, Korolev. Program: Vostok. Flight: Vostok 7. Spacecraft: Vostok. Apogee: 1,000 km (600 mi). Perigee: 200 km (120 mi). Inclination: 65.00 deg. The first supplemental Vostok flight planned in January-March 1963 was a high altitude manned flight into the lower Van Allen radiation belt for radiological-biological studies. All follow-on Vostok missions were cancelled in Spring 1964..
OKB-1 Program Review - . Nation: Russia. Related Persons: Gagarin, Kamanin, Komarov, Mishin. Program: Voskhod. Flight: Voskhod 3. Spacecraft Bus: Vostok. Spacecraft: Voskhod. Kamanin, Gagarin, Komarov, and other VVS staff attend the first program review held since Korolev's death. Mishin reviews spacecraft build status. Voskhod s/n 5 is to be shipped to Tyuratam on 1 February and launched in the first half of February. This is the spacecraft fitted for the 30-day unmanned biosat mission with dogs. Kamanin had argued with Korolev over the last year that this flight was unnecessary, but Korolev did not want to expose the cosmonauts to the risk of a long-duration spaceflight with a heavily modified spacecraft without an unmanned precursor flight. The manned flight of Voskhod s/n 6 on an 18-day mission can only begin after the landing of s/n 5, e.g. launch in the period 10-20 March. Voskhod/Soyuz crews - . Nation: Russia. Related Persons: Artyukhin, Beregovoi, Bykovsky, Gagarin, Gorbatko, Katys, Khrunov, Kolodin, Komarov, Matinchenko, Mozzhorin, Nikolayev, Ponomaryova, Popovich, Solovyova, Tyulin, Voronov, Zaikin. Program: Voskhod. Flight: Soyuz 1, Soyuz 2A, Voskhod 4, Voskhod 5. Tyulin and Mozzhorin review with Kamanin crewing plans. 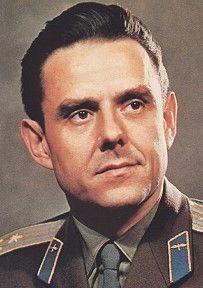 Even though the missions of Voskhod 4 and 5 are not yet clear, Tyulin wants to settle on Beregovoi and Katys for Voskhod 4, and Ponomaryova and Solovyova for Voskhod 5. Since October 1965 six crews have been in training for Soyuz flights: Gagarin -Voronov, Nikolayev-Gorbatko, Bykovsky-Matinchenko, Komarov-Kolodin, Zaikin-Khrunov, and Popovich-Artyukhin. But these are just nominal groupings, and firm crew assignments by mission have not yet been made. L1 and Voskhod - . Nation: Russia. Related Persons: Bushuyev, Gagarin, Komarov. Program: Voskhod, Lunar L1. Flight: Voskhod 4, Voskhod 5, Voskhod 6. Spacecraft: Luna E-6S, Soyuz 7K-L1, Voskhod. The Luna 10 robot orbiter has successfully entered moon orbit, conducted two radio communications sessions, including broadcast back to the earth of the "International", the Socialist hymn, to the 23rd Party Congress. Bushuev from OKB-1 is seeking cosmonaut representatives for the commission that will inspect the mock-up of the L1 circumlunar spacecraft. Kamanin nominates Gagarin, Komarov, Nikitin, Frolov, Smirnov, and others. Kamanin informs OKB-1 that he has obtained the support of the PVO and RVSN for the completion and flight of Voskhod s/n 7, 8, and 9. A letter to Smirnov asking for those fights to be conducted will be drafted. 1966 April 27 - . L1 Mock-up Inspection - . Nation: Russia. Related Persons: Bushuyev, Gagarin, Komarov. Program: Voskhod, Lunar L1. Flight: Soyuz 7K-L1 mission 1. Spacecraft: Soyuz 7K-L1, Voskhod. The L1 inspection has not gone well. The cosmonauts find that the spacecraft has the same safety problems as Voskhod: no spacesuits, no reserve parachute for the spacecraft, no signal sent when the parachute deploys (the UHF beacon only begins emitting 10 seconds after landing). Supposedly this unsafe and poorly designed spacecraft is supposed to take cosmonauts around the moon by November 1967. Kamanin finds this incredible. 1966 July 2 - . Soyuz crew manoeuvres - . Nation: Russia. Related Persons: Anokhin, Bykovsky, Dolgopolov, Gagarin, Gorbatko, Grechko, Khrunov, Kolodin, Komarov, Makarov, Malinovskiy, Mishin, Nikolayev, Rudenko, Smirnov, Tsybin, Tyulin, Ustinov, Volkov, Voronov, Yeliseyev. Program: Soyuz. Flight: Soyuz 1, Soyuz 2A, Soyuz s/n 3/4. Spacecraft Bus: Soyuz. Spacecraft: Soyuz 7K-OK.
Kamanin is back from leave and orients himself. VVS General Rudenko has been visited by Mishin, Tsybin, and Tyulin. They want to replace Kamanin's crews for the first Soyuz mission in September-October with a crew made up of OKB-1 engineers: Dolgopolov, Yeliseyev, and Volkov as the prime crew, Anokhin, Makarov, and Grechko as back-ups. Kamanin believes this absurd proposal, made only three months before the planned flight date, shows a complete lack of understanding on the part of OKB-1 management of the training and fitness required for spaceflight. Kamanin has had eight cosmonauts (Komarov, Gorbatko, Khrunov, Bykovsky, Voronov, Kolodin, Gagarin, and Nikolayev) training for this flight since September 1965. Yet Mishin and Tyulin have been shopping this absurd proposal to Smirnov, Ustinov, and Malinovskiy, who do not know enough to reject it. 1966 July 6 - . State Commission on Manned Spaceflight - . Nation: Russia. Related Persons: Anokhin, Belyayev, Bugrov, Bykovsky, Dolgopolov, Grechko, Komarov, Kubasov, Makarov, Mishin, Nikolayev, Tyulin, Volkov, Yeliseyev. Program: Soyuz. Flight: Soyuz 1, Soyuz 2A, Soyuz s/n 3/4. Soyuz s/n 3: VVS: commander: Komarov; backup Belyayev. MOM: commander: Dolgopolov; backup Grechko. Flight engineer: VVS: open; MOM: Makarov, Backup: Bugrov. Soyuz s/n 4: VVS: commander: Bykovsky; backup Nikolayev. MOM: commander: Yeliseyev; backup Anokhin. Flight engineer: VVS: open; MOM: Kubasov, Backup: Volkov. Kamanin is furious. Mishin and Tyulin think an engineer can be trained to be a spacecraft commander in three months, without passing a flight physical, without being a qualifed pilot, without screening and training on the centrifuge or zero-G aircraft, and without parachute training. They put no value in six years of VVS experience in cosmonaut training. They give no weight to the years of general training, spaceflight experience, and ten months of Soyuz-specific training his candidates have already had. He notes that the United States trains crews for a minimum of one to two years before a flight. Kamanin says this decision will not stand. Heated exchange with Mishin - . Nation: Russia. Related Persons: Darevskiy, Komarov, Mishin, Severin. Program: Soyuz. Flight: Soyuz 1, Soyuz 2A, Soyuz s/n 3/4. Spacecraft: Yastreb. Kamanin and VVS officers spend more than two hours in a heated exchange with Mishin and his staff at OKB-1. Mishin is attacked for delays in completion of Soyuz; his demand that OKB-1 cosmonauts be trained in VVS zero-G aircraft without any agreement on this having been reached; the lack of work on spacesuits for the Soyuz flights by Severin; and above all his "illegal" training of his own cosmonauts. Mishin responds with wild attacks against the competence of Kamanin's cosmonauts, saying that his engineers could better guide a spacecraft to a docking than Kamanin's pilots. Finally things cool down, and Mishin agrees to submit to Kamanin a list of OKB-1 candidates for cosmonaut training within two to three days. Kamanin agrees to consider how they may be prepared for flight on a two-month schedule. Later Kamanin's group visits Darevskiy at MAP and reviews the status of Soyuz trainer completion. He promises to have them completed by the end of August. Finally Kamanin confronts Komarov over statements he made in Japan. Komarov admits telling the world press that the Soviet Union will, at the scheduled time, fly an automated spacecraft around the moon and return it to earth, to be followed by a dog flight, then a manned circumlunar flight. Kamanin has already had the Central Committee and Soviet Ministers calling him about this unauthorised disclosure. 1966 July 26 - . Soyuz hatch problem - . Nation: Russia. Related Persons: Alekseyev, Semyon, Anokhin, Gorbatko, Khrunov, Komarov, Mishin, Severin, Sharafutdinov, Shcheglov, Skvortsov, Smirnov, Tsybin, Yeliseyev. Program: Soyuz. Flight: Soyuz 1, Soyuz 2A, Soyuz s/n 3/4. Spacecraft: Soyuz 7K-OK, Yastreb. Training of the new cosmonaut cadre is reviewed. English language courses are proving to be a particular problem. There have been some potential washouts - Sharafutdinov has done poorly in astronomy, Shcheglov suffered an injury at the beach, Skvortsov damaged his landing gear on a MiG-21 flight. At 15:00 a major review is conducted, with Komarov, Khrunov, Gorbatko, Kamanin, and other VVS officer meeting with OKB-1 leaders Mishin, Tsybin, Severin, Alekseyev, Anokhin, and other engineers. Film is shown of the difficulties in the zero-G aircraft of cosmonauts attempting to exit from the 660 mm diameter hatch. In four sets of ten attempts, the cosmonaut was only to get out of the hatch half the time, and then only with acrobatic contortions - the inflated suit has a diameter of 650 mm, only 10 mm less than the hatch. Mishin finally concedes the point. But installation of the hatch in Soyuz s/n 3 and 4 is not possible - the spacecraft are essentially complete, and to add the hatch would delay their flight 6 to 8 months. Then Mishin makes the astounding assertion that Gorbatko and Khrunov are not adequately trained to be engineer-cosmonauts, and without this he will not allow them into space. He suggests OKB-1 engineers Anokhin and Yeliseyev instead. After outraged response, Severin finally sinks this suggestion by pointing out that no space suit has been prepared for Anokhin, and that it will take two to three months to make one. Kamanin is astounded that Mishin has pushed Anokhin all the way up to Smirnov and the VPK without even knowing he could not possibly fly due to this restriction. It again points out their poor management. Finally Mishin agrees that spacecraft s/n 5 and 6 and on will have 720 mm hatches. The ECS for the suits for those missions will have to be changed from a backpack configuration, with the equipment rearranged around the waist of the cosmonaut. The crews for the flight will be an experienced VVS pilot cosmonaut as commander, and (Kamanin realizes he may have to concede) a VVS engineer as flight engineer cosmonaut. They will have to complete training by 1 October 1966. 1966 August 23 - . Soyuz recovery training at sea - . Nation: Russia. Related Persons: Afanasyev, Sergei, Burnazyan, Bykovsky, Gorbatko, Grechko, Keldysh, Khrunov, Kolodin, Komarov, Kubasov, Nikolayev, Smirnov, Volkov, Voronov. Program: Soyuz. Spacecraft: Soyuz 7K-OK, Yastreb. Nikolayev, Bykovsky, Komarov, Khrunov, Gorbatko, Kolodin, and Voronov complete two parachute jumps each, with landing at sea. Training in sea-recovery by helicopter, with the cosmonauts in spacesuits, will be completed over the next two days. Smirnov is ready to sign a letter from Afanasyev, Burnazyan and Keldysh creating a new civilian cosmonaut training centre under the Ministry of Medium Machine Building, separate from the VVS centre. The letter is not coordinated with the Defence Ministry, and contradicts the letter sent by the four marshals to the Central Committee. Kamanin prepares a vigorous refutation of the letter's position. The physicians' board on OKB-1 candidates has only cleared Yeliseyev for flight - they could not agree on Volkov, Kubasov, and Grechko. OKB-1 only submitted four candidates for review, not the eight promised. 1966 October 31 - . Soyuz crews have only 40 days for flight training. - . Nation: Russia. Related Persons: Bykovsky, Gagarin, Gorbatko, Khrunov, Komarov, Kubasov, Nikolayev, Volkov, Yeliseyev. Program: Soyuz. Flight: Soyuz 1, Soyuz 2A. First snow of the winter in Moscow. The training of Soyuz crews has to be completed within 40 days, but there is still no assurance the trainers will be ready by 15 November. Komarov will command the active spacecraft, and Bykovsky the passive. Gagarin and Nikolayev are their back-ups. The 20 December flight date can only be met if Khrunov and Gorbatko serve as flight engineers. Training of Kubasov, Volkov and Yeliseyev in 40 days is impossible. Yet there is still no agreement on the crew composition. 1966 November 3 - . Soyuz parachute fails in drop test. - . Nation: Russia. Related Persons: Bykovsky, Gorbatko, Khrunov, Komarov, Mishin, Tyulin. Program: Soyuz. Flight: Soyuz 1, Soyuz 2A. Spacecraft Bus: Soyuz. Spacecraft: Soyuz 7K-OK. In a test of the reserve parachute at Fedosiya, the Soyuz capsule was dropped from the aircraft at 10,500 m. The drogue chute deployed normally, as did the main parachute. They were then jettisoned and the reserve parachute deployed normally. However descent on both main and auxiliary chutes occurs only with noticeable pulsations of their cupolas, with the capsule revolving at one RPM. In this case it finally led to failure of the lines of the reserve chute at 1500 m, after which it crashed to earth. Contributing to the problem was the jettison of the remaining hydrogen peroxide reaction control system fuel from the capsule during the descent. It is normally expected that 30 kg of the 70 kg load of propellant will remain after re-entry. When this was vented, it burned the parachute lines. Each line will normally carry a load of 450 kg, but after being burnt by the peroxide, they can be torn apart by hand. Meanwhile there is still no agreement on crew composition. Komarov, Bykovsky, Khrunov and Gorbatko can be ready for flight by10 December. However the VPK representatives, Tyulin and Mishin insist that their OKB-1 candidates be flown in stead of Khrunov and Gorbatko. 1966 November 17 - . VVS told to surrender on crew assignments issue. - . Nation: Russia. Related Persons: Bykovsky, Kerimov, Khrunov, Kirillov, Komarov, Kuznetsov, Mishin, Rudenko, Yeliseyev, Zakharov. Program: Soyuz, Lunar L1. Flight: Soyuz 1, Soyuz 2A, Soyuz 7K-L1 mission 1. Kamanin is at Tyuratam for the first Soyuz launch. He and Rudenko are accommodated in the new hotel at Area 2. It has all conveniences - a local telephone, radio and television with Moscow programs, even a promise to install an HF telephone that will allow secure communications with Moscow. Also there for the launch are Kerimov, Kirillov, Kuznetsov, Bykovsky, Komarov, Khrunov, amd Yeliseyev. Rudenko reports that he has been chewed out by Marshal Zakharov. Zakharov told him "What are you and Kamanin doing, blocking OKB-1 candidates from flight? If Mishin wants to send his people to the Moon, let him do it and do not interefere!" 1966 November 18 - . Launch Vehicle: N1. N1 facilities tour - . Nation: Russia. Related Persons: Bykovsky, Gagarin, Gorbatko, Khrunov, Komarov, Kubasov, Mishin, Nikolayev, Rudenko, Yeliseyev. Program: Soyuz. Flight: Soyuz 1, Soyuz 2A. Spacecraft Bus: Soyuz. Spacecraft: Soyuz 7K-OK.
Rudenko and Kamanin meet with Mishin at Area 31 (18-20 kilometers east of Area 2). Launch preparations are reviewed, and Mishin satisfies them that the two Soyuz will be launched on 26-27 November. The State Commission will meet officially tomorrow at 16:00. For today, they tour the N1 horizontal assembly building at Area 13. Korolev planned the N1 as early as 1960-1961. It will have a takeoff mass of 2700-3000 tonnes and will be able to orbit 90-110 tonnes. The first stage of rocket has 30 engines, and the booster's overall height is114 m. The construction of the assembly plant, considered a branch of the Kuibyshev factory, began in 1963 but is still not finished. Two factory shops are in use, and the adjacent main assembly hall is truly impressive - more than 100 m in length, 60 m high, and 200 wide. Work on assembly of the ground test version of the rocket is underway. Assembly will be completed in 1967, and it will be used to test the systems for transport to the pad, erection of the booster, servicing, and launch preparations. The booster is to be ready for manned lunar launches in 1968. The construction site of the N1 launch pads occupies more than one square kilometre. Two pads are located 500 meter from each other. Between and around them is a mutli-storied underground city with hundreds of rooms and special equipment installations. Only late in the night Rudenko and Mishin finally agree that the crews for the first manned Soyuz flights will be: Basic crews: Komarov, Bykovsky, Khrunov, Yeliseyev; Back-up crews: Gagarin, Nikolayev, Gorbatko, Kubasov. Meanwhile poor weather in Moscow is delaying zero-G training for the flight. In the last week only one weightless flight on the Tu-104 was possible - and a minimum of 24 flights need to be flown before the launch. It was therefore decided to ferry one Tu-104 to Tyuratam and train the cosmonauts here - it made its first flight today. 1966 November 20 - . Soyuz first flight plan - . Nation: Russia. Related Persons: Bykovsky, Feoktistov, Khrunov, Komarov, Pravetskiy, Rudenko, Yeliseyev. Program: Soyuz. 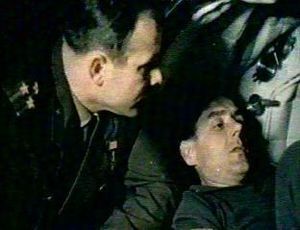 Flight: Soyuz 1, Soyuz 2A. Spacecraft: Soyuz 7K-OK, Yastreb. Feoktistov briefs the State Commission on the flight plan for the upcoming mission at 10:00. Each spacecraft will be in space for four days, and will demonstrate orbital manoeuvre, rendezvous and automatic spacecraft docking. If the passive vehicle can be placed in orbit within 20 kilometres of the previously launched active spacecraft, then docking can be accomplished on the first or second orbit of passive vehicle. If they are more than 20 kilometres apart, then 24 hours will be needed to manoeuvre the spacecraft to a rendezvous. Kamanin and Rudenko take a zero-G flight aboard the Tu-104 (Pravetskiy was bumped at the airfield "due to space limitations"). The Tu-104 needs good visibility of the horizon in order to fly the zero-G parabola. The aircraft is accelerated to maximum speed and then pulls up into a sharp climb (going from 7,000 to 10,000 m). At the end of the climb 20-25 seconds of weightlessness is available for training the cosmonauts. Komarov, Bykovsky, Khrunov and Yeliseyev are aboard today. Khrunov practiced moving from the BO living module of the passive vehicle to that of the active spacecraft. Yeliseyev practiced exiting and entering the BO hatches with his bulky spacesuit and 50- kilogram ECS system strapped to his leg. Mishin receives an encrypted telegram from Okhapkin and Tsybin. They propose that one of the cosmonauts on the first mission will back away from the docked spacecraft on a 10-m long safety line and film the other cosmonaut moving from one spacecraft to the other. Kamanin believes only Khrunov (with more than 50 Tu-104 weightless flights), has enough training to accomplish the task. After a sauna with Rudenko and an attempt to watch a film (aborted due to projector failure), Kamanin takes a walk in a drizzly, evocative night. He visits the cottages used by Korolev and the cosmonauts for the first missions. A light burns in Korolev's cottage - Mishin is working late. Kamanin recalls his many confrontations with Korolev, but also remembers how well he managed people compared to Mishin. Even if he had already decided personally what to do, he took the time to listen to other opinions and everyone felt their views had been considered. 1966 November 24 - . Apollo program delays give Soviets opportunity to leapfrog Americans - . Nation: Russia. 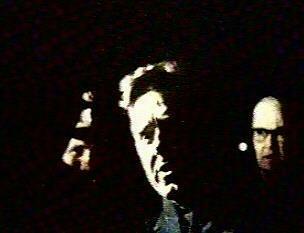 Related Persons: Bykovsky, Khrunov, Komarov, Yeliseyev. Program: Soyuz, Voskhod. Flight: Soyuz 1, Soyuz 2A, Soyuz s/n 3/4, Soyuz s/n 5/6, Soyuz s/n 7, Voskhod 3. Spacecraft: Soyuz 7K-OK, Voskhod. Komarov, Bykovsky, Khrunov, and Yeliseyev have completed zero-G training in the Tu-104 at Tyuratam, and need to get back to Moscow to complete simulator training. But continued bad weather at Moscow means that they will have to be flown by Il-14 to Gorkiy, and then get to Moscow by train. Kamanin notes reports on NASA's reorganised flight program for the Apollo program. Under the new schedule, the first attempt at a manned lunar landing will be possible in the first half of 1968. The first manned flight of the Apollo CSM has slipped from December 1966 to the first quarter of 1967. This makes it possible that the Soviets can make 3 to 5 manned spaceflights before the first Apollo flight - the flights of Soyuz s/n 3 and 4 in December 1966, Voskhod 3 in January 1967, and Soyuz s/n 3 and 4 in February 1967. Manual docking for Soyuz 1/2 - . Nation: Russia. Related Persons: Komarov, Ustinov. Program: Soyuz. Flight: Soyuz 1, Soyuz 2A. Spacecraft Bus: Soyuz. Spacecraft: Soyuz 7K-OK.
Ustinov reviews the cosmonauts. Kamanin urges that a manual docking be allowed on the Soyuz 1/2 mission - he had argued the same point with Korolev before his death. Komarov say he can accomplish a manual docking from 350 km range (once the Igla automatic system has brought him there from 23 km range). There follows a discussion of an all-female flight. Four female cosmonauts would be assigned to the mission, and Kamanin would need 5 to 6 months to complete there training. The mission is designated 'Voskhod-6'. 1967 April 23 - . 00:35 GMT - . Launch Site: Baikonur. Launch Complex: Baikonur LC1. LV Family: R-7. Launch Vehicle: Soyuz 11A511. Soyuz 1 - . Call Sign: Rubin (Ruby ). Crew: Komarov. Backup Crew: Gagarin. Payload: Soyuz 7K-OK s/n 4. Mass: 6,450 kg (14,210 lb). Nation: Russia. Agency: MOM. Program: Soyuz. Class: Manned. Type: Manned spacecraft. Flight: Soyuz 1, Soyuz 2A. Spacecraft Bus: Soyuz. Spacecraft: Soyuz 7K-OK. Duration: 1.12 days. Decay Date: 1967-04-24 . USAF Sat Cat: 2759 . COSPAR: 1967-037A. Apogee: 223 km (138 mi). Perigee: 197 km (122 mi). Inclination: 50.80 deg. Period: 88.70 min. 1967 April 24 - . Death of Vladimir Mikhailovich Komarov. Crash of Soyuz 1 spacecraft. - . Nation: Russia. Related Persons: Komarov. Crash of Soyuz 1. Cosmonaut Vladimir Mikhailovich Komarov is killed at age 40. - . Return Crew: Komarov. Nation: Russia. Related Persons: Komarov. Program: Soyuz. Flight: Soyuz 1. Komarov state funeral. - . Nation: Russia. Related Persons: Komarov. Program: Soyuz. Flight: Soyuz 1. Komarov's ashes are interred in the wall of the Kremlin..
1968 April 25 - . A memorial service is held for Komarov at his crash site near Omsk. - . Nation: Russia. Related Persons: Komarov, Matinchenko. Over 10,000 people come out to the steppe, some driving hundreds of kilometres for the event. Kamanin discharges Matinchenko from the cosmonaut corps. He was in two bad automobile accidents on 19 and 21 April. In one of the accidents a six-year-old child was killed.